In a large saucepan add the beef mince and gently brown on a medium heat. Add the onions and cook until soft then add the garlic. Add the mushrooms, tomatoes and aubergine and stir until they are a little soft. Add the tomato puree, paprika, Italian herbs and the Worcestershire sauce and stir in. Crumble half an oxo cube into the saucepan along with 200 ml of water. Put the lid on and simmer for 20 minutes for the sauce to thicken. While your ragu is simmering prepare your courgetti. Cut both ends of your courgette and attach to your spiraliser. Turn the handle to produce the "spaghetti", stopping periodically and detaching the strands to keep it a manageable length. Repeat with the other courgette and set aside. Take the lid off and add some freshly chopped basil and give it a big stir, leave to simmer for another 5 minutes with the lid off. Fry your courgetti in a saucepan with a little olive oil for one minute. 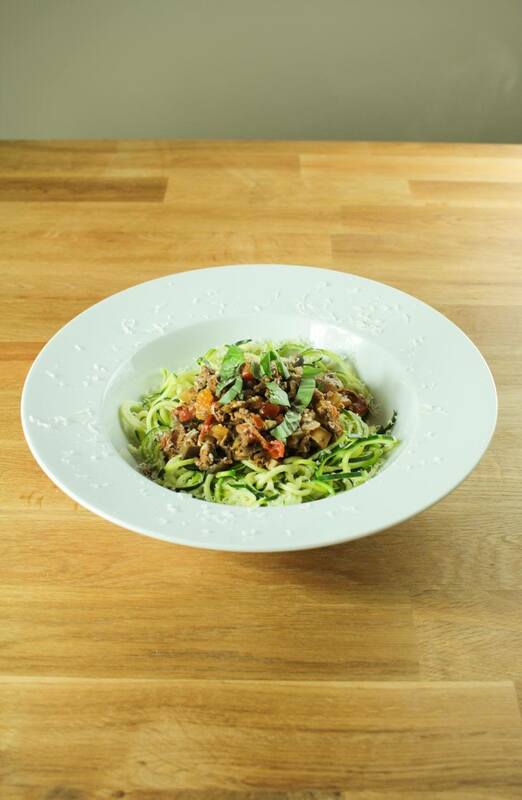 Add your courgetti to a dish with a generous portion of ragu, sprinkle with fresh basil and fresh grated parmesan if desired.